I have been researching and researching about skincare lately. If there is an ingredient I found that is said to make "miracles" happen, it would be Vitamin C. Vitamin C also is know as l-ascorbic acid. It is an antioxidant. I learned that Vitamin C, when applied to the skin, has shown to slow down the rate of free-radical damage (sun damage). It protects the skin from UV and even reverses signs of aging to the skin. It does this by stimulating collagen, minimize fine lines, scares, and wrinkles, and even gets rid of age spots. Amazing isn't it?! Upon my research, I also learned that it Vitamin C goes bad quickly and is highly unstable. Therefore I learned that it is better to purchase Vitamin C in powder form instead of buying products with Vitamin C already inside the products. I turned to a trusted company... Philosophy. 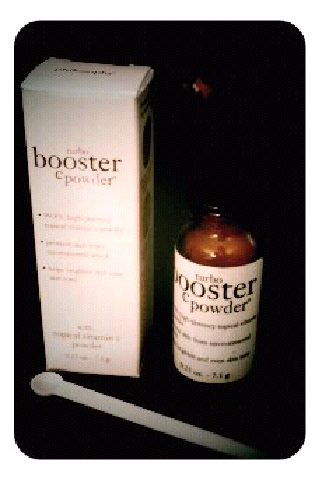 I purchased the Philosophy Turbo Booster C Powder, which contains 0.25 oz of 99.8% high-potency topical Vitamin C powder. Philosophy states that it protects skin from environmental attacks, brigtens and even skin tone. 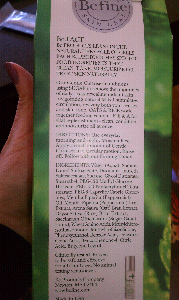 The directions say to mix 1/2-1 scoop of powder into your palm with your serum or moisturizer. I have been using a 1/2 scoop everyday after I wash my face. I mix it with my sunblock. I have been using it now for about a week and noticed that the redness on my face has become less. I also noticed that my skin does look healthier. I think I am going to continue using this product and will report back. Want flawless, light, even coverage? This foundation does amazing things. I genuinely love it. 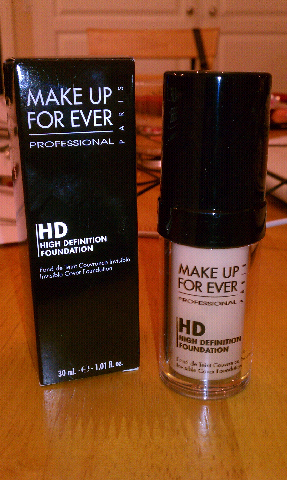 Make Up For Ever came out with this foundation a couple years ago for people who work in television. It's made especially for HD and photography. It's full coverage and looks like natural skin. I feel that a little goes a long way. I've used it for about 3 years now and I still love it. It comes in a convenient pump bottle with 1 oz. for $40. I get a ton of complements when I use it. It's money well spent. I cannot stress enough how important it is to wear sunblock, especially one that is SPF 30 and above. Below is a product that I use. 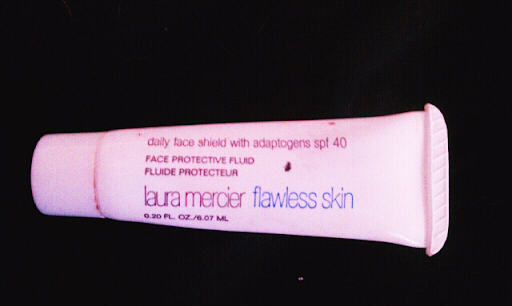 This Laura Mercier Flawless Skin Daily Face Shield has SPF of 40. I just finish this product and I loved it because it was an awesome product under makeup. It was extremely lightweight and did not look oily. It's texture is a little runny but that is what makes it so light. It made my skin feel so smooth and I used it instead of a primer. I always look for a sunblock that would be good under makeup and this sunblock was it. Laura Mercier advertised it as being oil controlling, sheer, lightweight, and allowing skin to adapt to extreme climates. I got these done yesterday for a wedding. 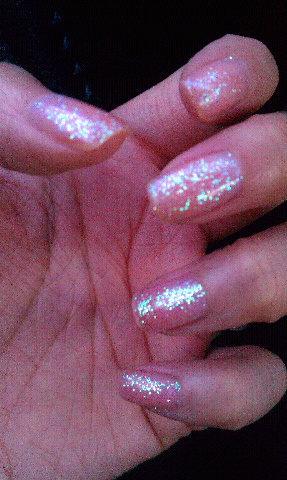 My manicurist used a pink sheer gel over my nails and sprinkled iridescent white glitter over the gel. It came out looking lovely. I came home today to have my mom help me do alterations my evening dress and she had a gift for me. She got me a large bag to go traveling with. It's awesome because the little gold chain you see below has a key. 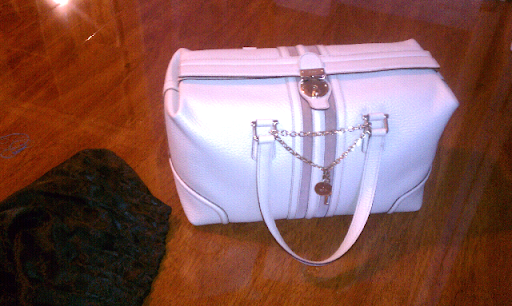 The key is made to lock to top opening of the bag. I can actually lock it to ensure no one goes in it. It's the perfect size to travel with. I am so happy and I so love my mom =). I got these in the mail today courteous of the boyfriend. I was complaining about how my black patent leather pumps were scuffed up and worn out and needed a replacement. These are its replacement. The order was placed at least 3 weeks ago and finally they are here. It took forever but just in time for a wedding. 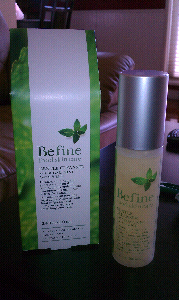 My Be Fine Gentle Cleanser ($15.99/3.4 oz.) came into the mail today along with some other products. It is a day and night cleanser that contains oats and rice. 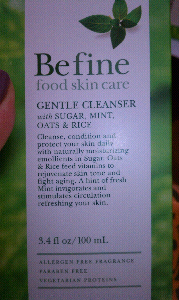 The oats and rice are suppose to feed vitamins into the skin to help rejuvenate, tone, and fight aging. The cleaner smells minty fresh like peppermint. The packaging states that it will support collagen growth and simulate circulation. I have not tried it but I cannot wait. 1. MacBook Air- I'm small and the size is perfect for me to carry wherever. It's been wonderful to me. 2. Ipad 2- I have my MacBook Air but this is perfect to use in bed laying down. I love that it is touch screen which makes browsing so much easier. I am thinking of even getting one for my mom. 3. Make Up For Ever HD Foundation (128)- The best full coverage foundation out there that looks extremely natural. And it's awesome for photography! $40 a bottle well spent. 4. Hair Tinsels- So much fun for the summer and in the sun play. 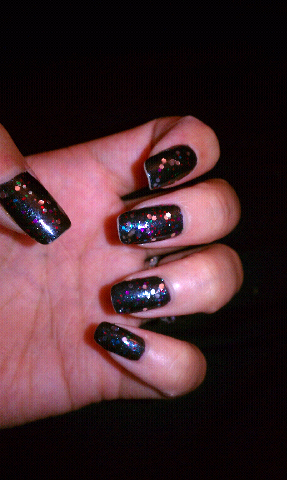 I like the subtle black ones. I get tons of compliments when they are in. I am definitely getting them put in for the cruise. 5. Sony Waterproof Camera- An awesome gift I got for my cruise. Last time we went I had to make sure the camera did not get wet... well with this one I will have no worries. I love it. 6. MAC Acrylic Paint (in black as liquid eye liner)- I almost wear liquid eyeliner everyday and its a pain when it runs out. I discovered that I could use the acrylic paint in black (.6 oz) because it is water proof and safe to us around the eyes. Its been great to me. 7. Cosmetic Mirror with Light- My biggest annoyance with applying making is lighting. Prior to getting my cosmetic mirror with a light, I was using just a large mirror with my room light. It was always too dark and did not shine directly on my face. With this new item I can easily see what is going on, especially because it has a magnification mirror on the back where I can rotate. Awesome! 8. Ipod Nano in Graphite- Jogging would be so boring without it. It's awesome to transfer music from my MacBook Air and it clips on my shorts. I love that I can easily switch songs with two clicks. Its the perfect gadget for a runner. 9. Dinair Airbrush System- This airbrush machine definitely makes applying makeup fun. It's fast and does make your skin look flawless. Its great for airbrush art of all kinds. It was a really good investment. 10. Chanel Large Flap Bag- It's Chanel and it's a classic. Need I say more? 1. Carisonic Cleaning System- Because I use makeup everyday, I need a good cleaning everyday. This little tool is suppose to deep pore clean and exfoliate the skin leaving it polished and feeling lovely. I believe it would be awesome for someone like me who uses cosmetics everyday. 2. Nike Running Shoes- Nike has the cutest running shoes that are lightweight and comfortable. My shoes now are worn out and I am in desperate need of some new ones. 3. Ipod Speakers (works with nano)- I really want some for travel or just to use at home while I am getting ready. 4. Inglot Eyeshadows- I heard they are comparable to MAC's and come in a variety of colors. I love their palettes and how they give you so much product for much cheaper than MAC's. 5. 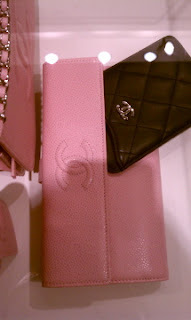 Chanel Quilted Wallet (with a zip pocket)- I cannot have a purse without a matching wallet. Their zip pocket ones are the perfect size. 6.Illamasqua Rich Liquid Foundation in 215- I heard that its an awesome full coverage foundation that would also be good for photography. I love how Illamasqua's products are extremely pigmented and a little goes a long way. I really want to test this product out. 7. Face Steamer- Like I said prior, I love a good cleaning. Face steamers open up your pores for some good cleaning. 9. Crest 3D White 2 Hour Express Whitestrips- Two hours? Hell ya! I hate using the old white strips for 2 weeks everyday to get results. Convenience is the way to go and if it only takes 2 hours, I'll do it. 10. Diamond Earrings- Yes... I can't resist putting it on my list. There is nothing more beautiful yet still so simple. I envy all the ladies that already has some. Between being super busy and the madness I somehow kept calm to take care of everyone and pull their makeup together. Maybe because I love doing it. I will start with the most obvious, the black swan. Below is actually my sister as the black swan. I started off with the eyes to clean any fall out easier. I used liquid liner, gel liner, liner, and glitter. I chose lashes that were obvious but not too much. The red on the eyes was my recommendation to her because I wanted a bit of color to still help the eyes pop. The net design around the eyes was also thought up by me. There is a scene in the black swan where she wears nets over her face while she transforms into the black swan. I used that as inspiration and did it around the eyes for a dramatic effect. My sister, Kimmy, loved it. I was also inspired by the scene where Natalie portman applies white powder on her face after she kills another ballerina so I incorporated that into my sisters version by applying it to her nose and under her eyes. It helped highlight her features. I finished with dark red lipstick and dark red conturing. As for her hands, I smeared black and white all over to give het a grudgy look. 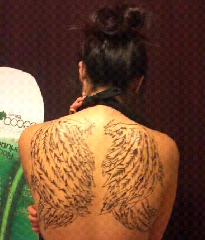 The false tattoo looking wings I did in about 45 minutes. I originally wanted to fill them in with paint bit the empty unfinished look made it look raw. Her feather corset is actually mine from Victoria Secret and the crown was actually a children's. Everything was pulled together perfectly I am I so happy how she turned out. Don't you agree? The Marilyn Monroe is my mom. She made herself the dress and I went with her to get the wig. Her makeup was the easiest. I chose to contour her eyes like the shape that miss Monroe has, a deeper hallow toward the upper crease. I keep her eyes simple with some flared out lashes and mascara. I also copied marilyn's brows to make her look as much like marilyn as she can. Of course the last obvious thing was to give her red lips with gloss. She felt amazing and you can tell at the party. 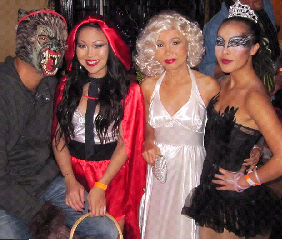 The little red riding hood makeup was me :). It was very similar to my moms Marilyn Monroe but more dramatic. I did a cut crease with silver on the lids and brown in the crease. I drew some winged liner on top and bottom. I also applied rhinestones around the eyes and applied thick lashes. On the lips I used my moat favorite red lip color, MAC Red. The red matched my hood and skirt which made all the red pop. I recently ordered this Victoria Secret Miraculous leopard bikini online. Well I got it today :). I got it for my up coming cruise. We are going to the Caribbeans for the New Years and my birthday. It is a 9 night cruise on the second largest cruise ship in the sea, The Freedom of the Sea. We went on the Oasis last March and it was the best experience so we had to book another cruise. Being the diva I am, I want to bring at least 5 different bathing suits. I am so excited.